I wish you could smell these Malmaison carnations. They are old fashioned glorious! More like a rose than a carnation, these historic flowers were displayed by Jim Marshall at RHS Hampton Court this week. They rightly won Gold and Best in Show in the plant heritage section of the floral marquee. They remind me of buttonholes, Floris soap, and country house glasshouses. Such a romantic clove-like scent, and a story of rescue and revival. The Malmaison carnation originated in France as a chance seedling. It was named Souvenir de la Malmaison after the rose grown in the Empress Josephine’s garden and quickly became fashionable. Nurserymen started to breed new forms in a sumptuous range of colours. Favourites of English country houses until the Second World War, they gradually died out due to disease and labour intensive requirements. 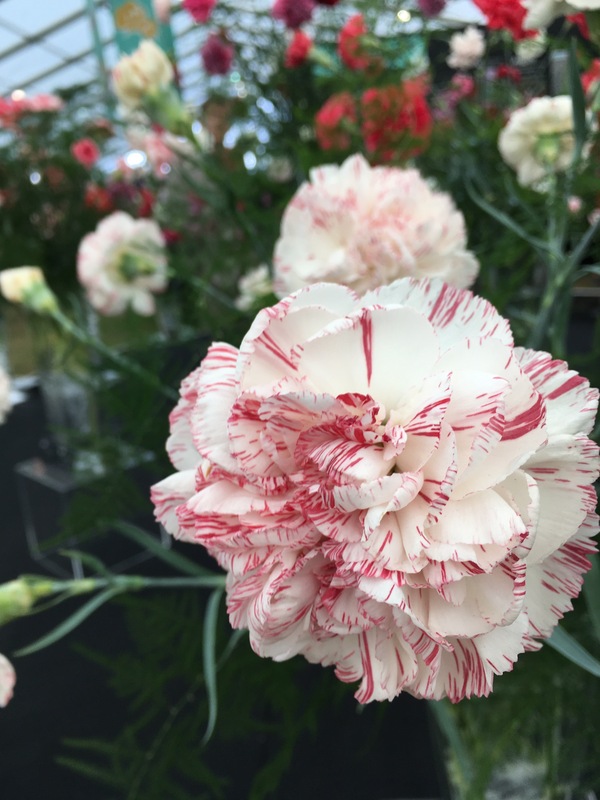 Malmaison carnations are prone to damping off disease and red spider and need constant renewal by cuttings and layering. 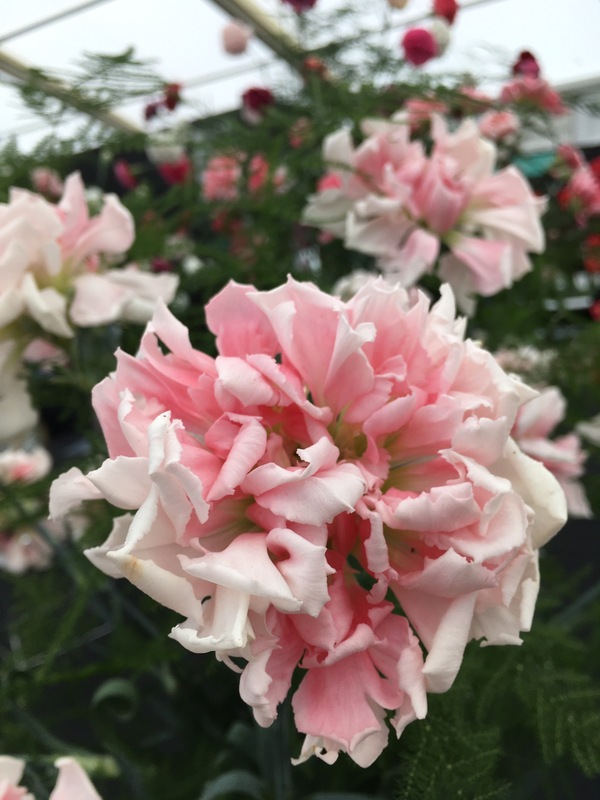 Grower Jim Marshall has made it his life’s work to save the carnation and now uses micro-propagation to improve vigour and disease resistance. Plant supplies for sale are still in relatively short supply and favourite colours soon sell out. They are a bit of a challenge, but well worth the effort for the beautiful colours and unforgettable scent. For more information contact Plant Heritage, jim@malmaisons.plus.com. 01473822400 Hullwood Barn, Bolton Lane,Shelley, Ipswich IP75RE. Goodness, these are gorgeous! I hope I see them next year at the Chatsworth Flower Show. They are intriguing. Couldn’t fail to spot them at Hampton Court. The whole heritage section was awash with the scent. Worth a spot in the greenhouse -even if they are a bit of a challenge. The Malmaison Carnation evokes images of tatty crinolines. I wonder if this is indicative of its level of hardiness. So beautiful! They look vintage to me-stunning. You’re welcome. I would love to try a grow them. This is the first time I’ve been a “stay at home wife” and I have a very small but beautiful veggie garden and am hoping I can continue to stay home and start a flower garden. Kathy muchas gracias por mostrarnos esta bella flor que como dice huele de maravilla. Son preciosas.Saludos de Margarita.